For Halloween, we got it into our heads that we were going to dress up as Dan and Phil, and we meticulously planned our costumes for literally months, well maybe weeks anyway. 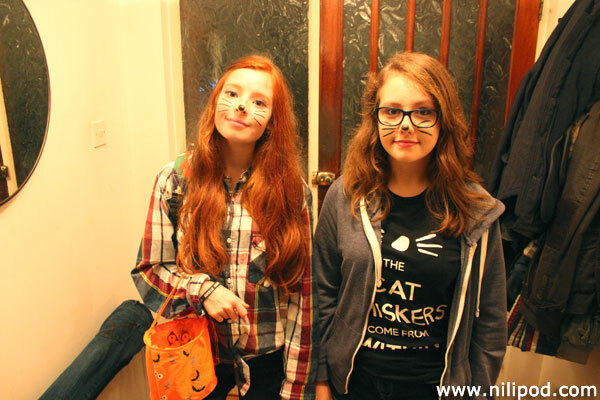 Nia wore one of her dad's checked shirts, while Liv sported an actual Dan and Phil T-shirt, which says' The Cat Whiskers Come From WITHIN'. Not quite sure what it means, but we love them nonetheless. And of course, we painted our noses black and whiskers on our cheeks, so that we looked a bit like them, with their cat's whiskers. Although most people wondered what we were dressed up as, we thought we looked brilliant and we got lots of chocolate when we went door to door Trick or Treating. Where we live, people that want to participate generally put a pumpkin outside of their front door or in the window, and so it is easy to find receptive houses with a good supply of spooky chocolate and sweets. We even got a bag of 'mould cheeses'. Not sure what they are? Then tune into Episode 2 to find out!